The School of Music prides itself in the individualized attention it provides to students majoring in liberal arts, music business, music education, music composition, music therapy, music performance, collaborative piano, and graduate conducting. The sequence is intended for those who wish to pursue a career in business professions related to music. Students who enjoy improvising or learning about how music is put together may be composers. The Jazz Studies program is designed to develop abilities as jazz performers, composers, and arrangers. The Bachelor of Arts in Music and the Bachelor of Science in Music are for those students searching for a broad-based academic degree. Performance majors are excited to spend the majority of their academic career rehearsing and practicing for the numerous performance opportunities here and at local performance venues. Illinois State University is the largest teacher training institution in Illinois, and music faculty cooperate closely with professors in the College of Education. The curriculum for the bachelor's degree is designed to impart entry level competencies in three main areas: musical foundations, clinical foundations, and music therapy foundations and principles. The Music-Liberal Arts minor is for those students searching for a broad-based academic minor. The Master of Music in Collaborative Piano focuses on accompanying and chamber music, collaborating with a wide range of instruments and voice, plus the opportunity to play in large ensembles and in operatic settings. The Master of Music in Jazz Performance program helps students develop their professional abilities as jazz performers and improvisers with private jazz instruction, small and large ensemble participation, improvisation courses, and other traditional academic music courses. The Master of Music in String Pedagogy trains students to become qualified and knowledgeable string teachers. The Master's degree in Composition is a good program for students interested in pursuing a Ph.D. in composition and would like to build their portfolio, or for students who are interested in pursuing teaching as a career. Graduates of the conducting program often go on for doctoral studies in conducting, continue as conductors in school and community college settings, and/or conduct church or community choirs. All Music Performance Majors at Illinois State University are afforded the opportunity of intensive study in their medium with a highly qualified and professionally accomplished artist-teacher. While studying current issues in the profession, the student is given the opportunity to develop a specialized area of concentration. The Master of Music in Music Therapy is designed to produce highly qualified and knowledgeable music therapists who have advanced training in music and its therapeutic applications. Piano, guitar and voice lessons are open to all majors, as are choirs, orchestra and bands! Classes in black music, history of jazz and world arts in music can be taken to fulfill general education requirements! New students, Apply to the University! On the University application you will be asked to choose your audition date. Current students can reserve their audition using My.IllinoisState. If you live outside of Illinois, you may submit your audition via Acceptd. Review ‘Suggested Repertoire’ for your specific instrument (listed on the individual studio pages) to prepare for your audition. Provide us a letter of recommendation from a music professional, music@IllinoisState.edu. Bring your music resume to your audition. Students transferring from 4-year colleges and universities need to provide a Transfer Acknowledgement Form to us before scholarship consideration can be made. Contact Dr. Karyl Carlson with questions about choral ensemble hearings. Choral placement auditions for those who did not audition last spring (incoming students and ALL RETURNING VOCALISTS) will be Sunday, August 19, 2018, 1-5 p.m. in Cook Hall room 109. Incoming freshmen non-music majors enroll in Women's Choir (for female voices) or Men's Glee (for male voices). Incoming freshmen music majors enroll in Belle Voix (for female voices) or Men's Glee (for male voices). Unified Auditions are open to ALL students regardless of major who wish to be considered for all major ensembles. Students participating in Unified Auditions are required to prepare all provided excerpts. Music majors are required to participate in the Unified Ensemble Auditions. Symphonic Band Only Auditions are open to students who are not music majors and wish to be considered only for Symphonic Band. Students participating in Symphonic Band Only Auditions will prepare select excerpts as indicated in the Audition Packet. These auditions will happen at the same time as Unified Auditions. Music majors and percussionists are not permitted to use this audition option. Students who wish to perform only in the University Band should register for the course as auditions are not required for participation in that ensemble. Further instructions will be emailed to all those enrolled in the course. Download and prepare the Audition Music which will be available no later than November 5. Audition music will be available on the School of Music website. Register for the ensemble that you believe is your most likely ensemble placement. Should you be placed in a different ensemble, you can change this later. If you are unsure of what class in which to enroll, you can contact your academic advisor, Prof. Marinello, and/or the applied faculty member for guidance. Complete the online survey by Monday, November 12 in order to audition for any of the ensembles listed above. Students should arrive 30 minutes before their audition block to check-in and sign up for an audition time slot. If you are planning to participate only in University Band, you do not need to partake in an audition. Simply enroll in the course. All Auditions are held in Cook 212 unless otherwise specified. Students should arrive 30 minutes before their audition block to check-in and sign-up for an audition time slot. Contact Tony Marinello with any questions or concerns. Sign up for an audition time on Prof. Tom Marko’s bulletin board or contact Prof. Marko directly to set up an alternate time via email or at (309)438-2541. Tuesday, Dec. 4: 12-1:45 p.m.
Wednesday, Dec. 5: 12- 3 p.m.
Friday Dec. 7: 12-3 p.m.
Jazz audition requirements are available on the jazz bands page. Sunday, January 13, 2019 in Kemp Recital Hall. All repertoire will be chosen the Firebird Suite (1919 version) by Igor Stravinsky. 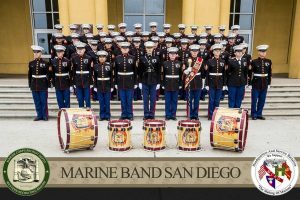 As part of its 2019 Midwest tour, the Marine Band San Diego will perform at the Center for the Performing Arts Concert Hall on Tuesday, April 16, at 7 p.m. The concert is free and open to the public.